This week my guest on the blog is my sister in law (hubby’s sister) Varaharupa. When I got married, she was a vision of a modern ISKCON devotee with short hair cut, loved dressing up and never saw her without any jewellery. Things changed when she got married, it was only saris and her jewellery. After my marriage, obviously friends and families of my in laws would invite us for dinner or lunch to their place. As most newly weds would want to, I’d want to wear my saris but didn’t know how to drape them well. Varaha would help me to drape them. Her stay in Canada and Vrindavan temples meant that she would meet a lot of foreign devotees who brought with them foreign cuisine, the vegetarian version. When she would come home to visit, she’d want to try some of the dishes and some of them we had tasted for the first time.One such variety she had made was piroshki but with a veg filling. It was so yummy and we felt elated that we had tasted a Russian dish. Her amicable nature has resulted in many friends both within and outside the ISKCON community. Along with her husband, a devotee too, they both have taken care of the Kalakshetra at the ISKCON Juhu Temple, arranging for a variety of ballads, dance and bhajan programs. Varaha has an eye for good colour combination and design. She has many a times helped designers and embroiderers with ideas for the dresses of the deities at the temple. What I admire about her is her discipline. She loves food but was able to put herself through a diet and exercise routine. She has lost weight and is fit as a fiddle.I never hear her complaining about her health. I on the other hand lack discipline in this area. I was expecting that Varaha would probably share a Kashmiri dish with us as she’s married to a Kashmiri Brahmin and has over the years learnt the cuisine from her mother in law and sister in law. However, when she sent me a cake recipe I was surprised. However, over the phone she told me excitedly that she learnt to bake it from her devotee friend and was so happy that it turned out well. 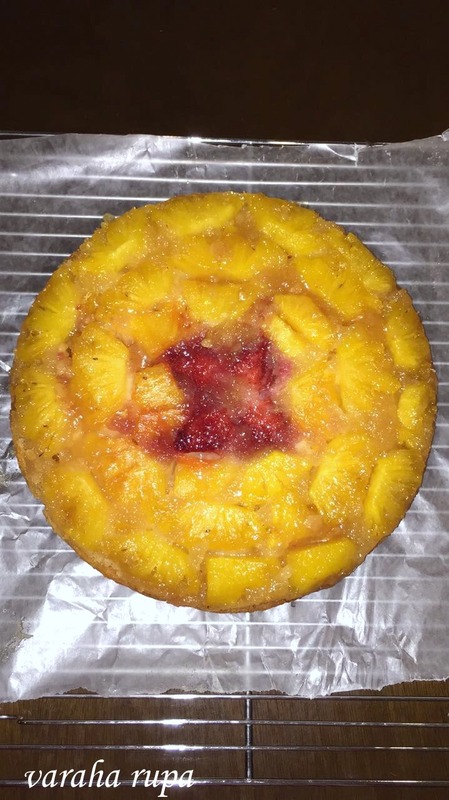 So here’s her eggless pineapple upside down cake and it looks so good and tempting. When I became an ISKCON devotee in 1971 though being a vegetarian I used to eat eggs. When Janamashtami came I was asked to bake an eggless cake for Lord Krishna. I tried to find cook books for the recipe as back then there was no internet. Finally I had to use my mum’s eggless cupcake recipe. Mayuri, my brother’s wife is a blessing in our family. Her light hearted presentation of healthy, delicious, attractive and innovative cuisine continues to shake off the outdated notion that vegetarian food is dull and lacks lustre. Mayuri’s creativity takes us on a trip around the world with her ingenious food from different parts of the world. It is God’s gifted talent and cooking is her passion. She’s good at booking keeping, well versed in general knowledge and we are truly blessed to have her in our family. I would like to share an Albert Einstein quote ” Vegetarian food leaves a deep impression on our nature. If the whole world adopts vegetarianism it can change the destiny of humankind”. Grease a 9″ round cake pan with butter. Put sugar and butter in a small pan over medium heat. Stir till the butter melts and the sugar has dissolved. Continue to cook without stirring or a few minutes till the mixture begins to bubble at the sides. The sugar will have begun to caramelize. Pour the mixture into the prepared cake tin or pan. Evenly arrange the pineapple pieces over the sugar mixture till the whole bottom is covered. Put the cherries in the middle of the pan if you are using any. Sieve flour with baking powder, cream of tartar and salt into a bowl. In another bowl, cream sugar and butter together till its soft and fluffy. Add the milk,yogurt and vanilla extract. Mix well. Add the flour mixture to the creamed mixture. Pour the batter over the layered pineapple. Bake the cake for 40-45 minutes, until the top is golden brown and the cakes starts to pull away from the sides of the pan. Another way to check is to insert a toothpick or a fork into the middle of the cake. If it comes out clean then the cake is done. Let the cake cool for a bit in the pan. Then remove it from the pan.Before you do that, take a plastic spatula and gently it run it all around at the edge of the cake. Place a plate upside down over the cake tin. Hold the plate and cake tin together. Flip it over. Put the plate on the worktop with the cake tin on top. Tap the bottom of the tin gently and cake should come out. Serve on its own or with some custard. If you prefer, you can layer the tin with round slices of pineapple. Use tinned pineapple if fresh is not available. Don’t cook the sugar and butter mixture for too long. You may get a hard caramelized mixture. If you don’t have cream of tartar, then replace it with ½ tsp lemon juice or vinegar. The cream of tartar reacts with the baking agent to produce carbon dioxide to make the cake or cookies more lighter and airy. For every ½ tsp of cream of tartar use 1 tsp lemon juice or vinegar. Mayuri , you are blessed with so many talented lovely family members, this recipe sounds awesome. I love that its eggless too.